We at Insider Monkey have gone over 700 13F filings that hedge funds and prominent investors are required to file by the SEC. The 13F filings show the funds’ and investors’ portfolio positions as of December 31st. In this article we look at what those investors think of Franklin Resources, Inc. (NYSE:BEN). Is Franklin Resources, Inc. (NYSE:BEN) a buy right now? Money managers are becoming less confident. The number of long hedge fund bets retreated by 1 in recent months. Our calculations also showed that BEN isn’t among the 30 most popular stocks among hedge funds. BEN was in 28 hedge funds’ portfolios at the end of the fourth quarter of 2018. 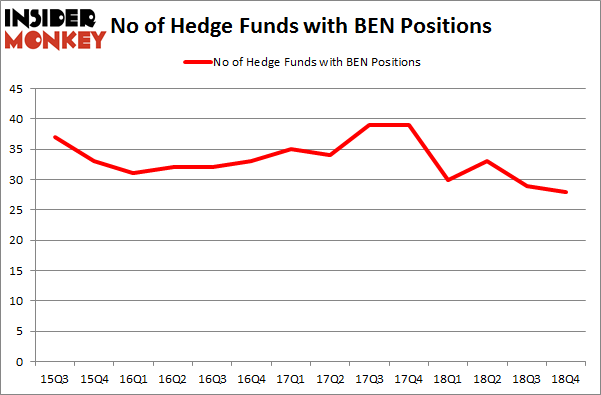 There were 29 hedge funds in our database with BEN positions at the end of the previous quarter. We’re going to view the new hedge fund action regarding Franklin Resources, Inc. (NYSE:BEN). How have hedgies been trading Franklin Resources, Inc. (NYSE:BEN)? Heading into the first quarter of 2019, a total of 28 of the hedge funds tracked by Insider Monkey were long this stock, a change of -3% from one quarter earlier. Below, you can check out the change in hedge fund sentiment towards BEN over the last 14 quarters. So, let’s see which hedge funds were among the top holders of the stock and which hedge funds were making big moves. When looking at the institutional investors followed by Insider Monkey, Abrams Capital Management, managed by David Abrams, holds the number one position in Franklin Resources, Inc. (NYSE:BEN). Abrams Capital Management has a $297.7 million position in the stock, comprising 12.3% of its 13F portfolio. 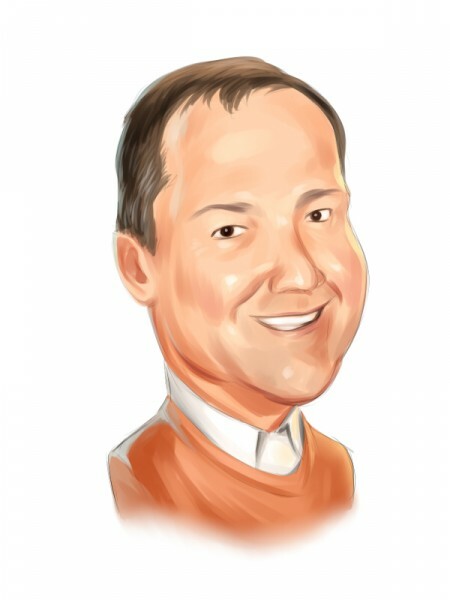 Coming in second is Pzena Investment Management, led by Richard S. Pzena, holding a $278.7 million position; the fund has 1.6% of its 13F portfolio invested in the stock. Some other peers that are bullish comprise Jonathon Jacobson’s Highfields Capital Management, Bernard Horn’s Polaris Capital Management and Amit Wadhwaney’s Moerus Capital Management. Seeing as Franklin Resources, Inc. (NYSE:BEN) has faced a decline in interest from hedge fund managers, it’s safe to say that there were a few money managers that slashed their full holdings last quarter. Intriguingly, Matthew Hulsizer’s PEAK6 Capital Management dropped the biggest investment of the “upper crust” of funds tracked by Insider Monkey, valued at about $2.2 million in stock. Ben Levine, Andrew Manuel and Stefan Renold’s fund, LMR Partners, also cut its stock, about $0.4 million worth. These transactions are important to note, as aggregate hedge fund interest dropped by 1 funds last quarter. Let’s go over hedge fund activity in other stocks – not necessarily in the same industry as Franklin Resources, Inc. (NYSE:BEN) but similarly valued. These stocks are BioMarin Pharmaceutical Inc. (NASDAQ:BMRN), TAL Education Group, Inc. (NYSE:TAL), Continental Resources, Inc. (NYSE:CLR), and NetApp Inc. (NASDAQ:NTAP). This group of stocks’ market values are similar to BEN’s market value. As you can see these stocks had an average of 29.5 hedge funds with bullish positions and the average amount invested in these stocks was $978 million. That figure was $817 million in BEN’s case. BioMarin Pharmaceutical Inc. (NASDAQ:BMRN) is the most popular stock in this table. On the other hand NetApp Inc. (NASDAQ:NTAP) is the least popular one with only 21 bullish hedge fund positions. Franklin Resources, Inc. (NYSE:BEN) is not the least popular stock in this group but hedge fund interest is still below average. This is a slightly negative signal and we’d rather spend our time researching stocks that hedge funds are piling on.Our calculations showed that top 15 most popular stocks among hedge funds returned 19.7% through March 15th and outperformed the S&P 500 ETF (SPY) by 6.6 percentage points. Unfortunately BEN wasn’t in this group. Hedge funds that bet on BEN were disappointed as the stock returned 12.3% and underperformed the market. If you are interested in investing in large cap stocks, you should check out the top 15 hedge fund stocks as 13 of these outperformed the market.